Update from Brenda G. April 2019: Definitely smoking areas after security. At Gate A08. Smoking area in terminal A near A08. As of 13th Sept 2018. feedback from Dan. Update from Brenda G. April 2019: Definitely smoking areas after security. Across from C42. 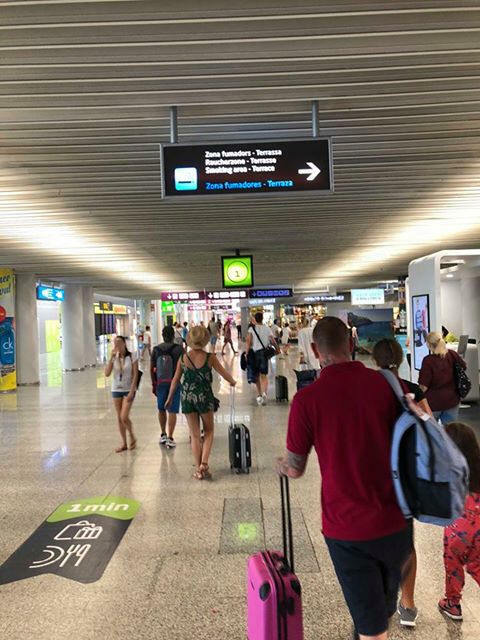 Update from Manfred H. on the 30th Aug 2018: There is a Smoking area in Palma Airport-PMI after Security, in the middle of the C Gates. I just enjoyed a cigarette there. Photo below. Tip from Steven: Just been through and had 3 hours before my flight, went to find a smoking area and there are none - however security are more than happy for you to leave and re-enter but you have to go back through security. Make sure you have enough time before your flight. It takes around 2 minutes from burger king (head near gate B to the travellator and round, speak with security at no passback gate and they let you through). 12th August 2017. 04/09/2016, confirmation from Aled R.: You can no longer smoke after going through security in departures. All smoking rooms have been removed. A tip from Aled R.: Before security and after check in, there is a terrace which over looks the security and the que time clocks, so you can sit there and smoke until as late as you dare before heading through. So as far as we know expect no smoking facilities inside the terminals. For connecting flights you may need to enter Spain and smoke outside terminal then go through Security again for your flight.